Many months a go, I styled a few pictures for Homesense’s Christmas shoot. 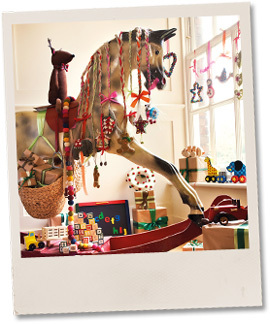 A hallway was turned into a forest and we went apple bobbing in a bath but here is a rocking horse with disco hair carrying lots of xmas presents. Photography by Mel Yates. See some behind the scenes snaps on the Homesense blog.